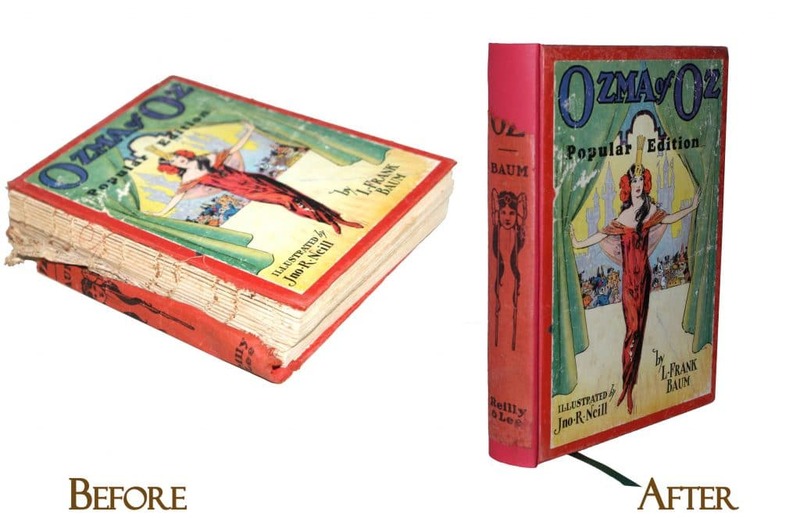 Our bookbindery has seen hundreds of damaged books with detached covers and spines for book restoration. Many of the books we see have extensive taping on the covers to keep them together. We can restore and preserve these books. We also can fix any ripped or torn pages. Click on page repair for more information. 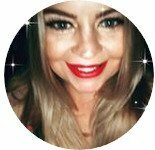 This page outlines the types of books we restore and our techniques. Can you restore my book? Do you do antique book restoration? 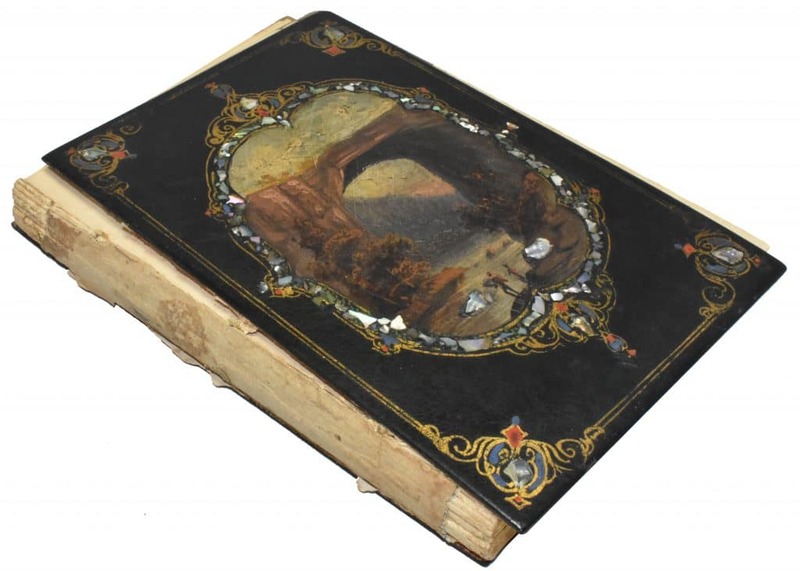 Our bookbinders have years of experience in book restoration and can restore virtually any books. 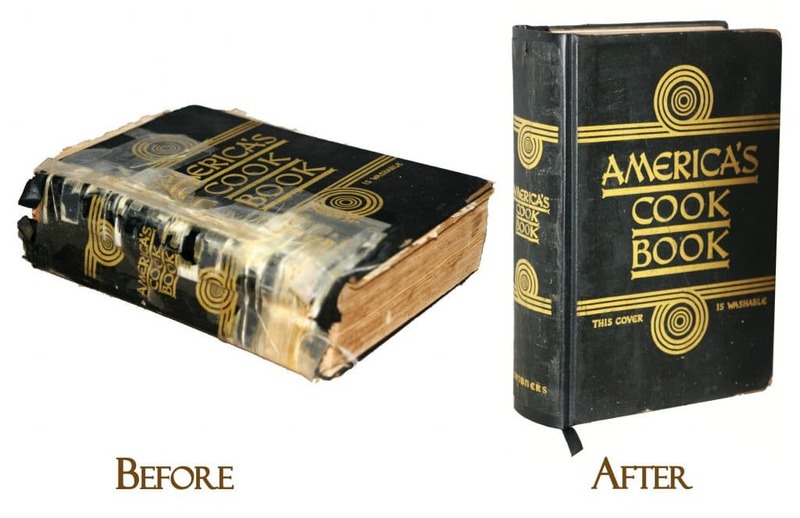 Antique book restoration is the same process as a book restoration. 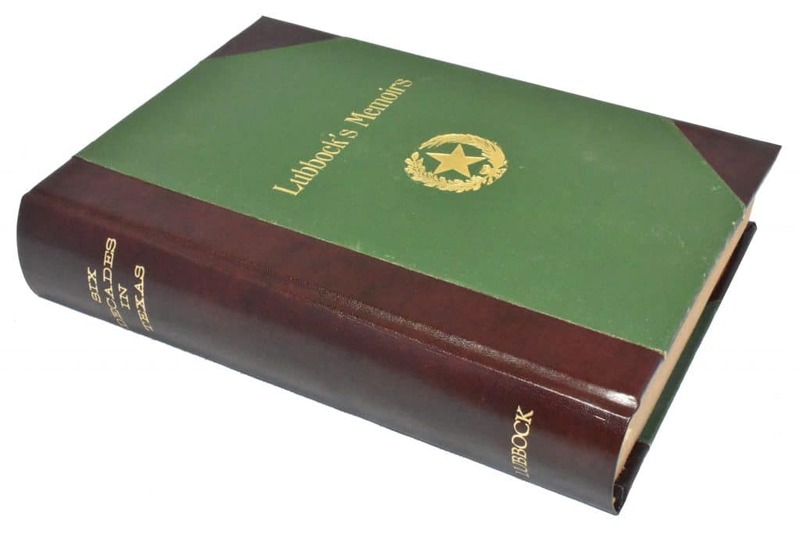 For examples of our work, please click on children's books, yearbooks, cookbooks, wedding album repair, reference books, family history or genealogy repair and literary books. If you have a book that is not referenced on one of these pages, contact us to discuss. To learn more about our bookbinding techniques in book restoration, then continue reading. If you are ready to meet with us or send us your book for book restoration, then click on GET STARTED. We are here to help! Contact Us! 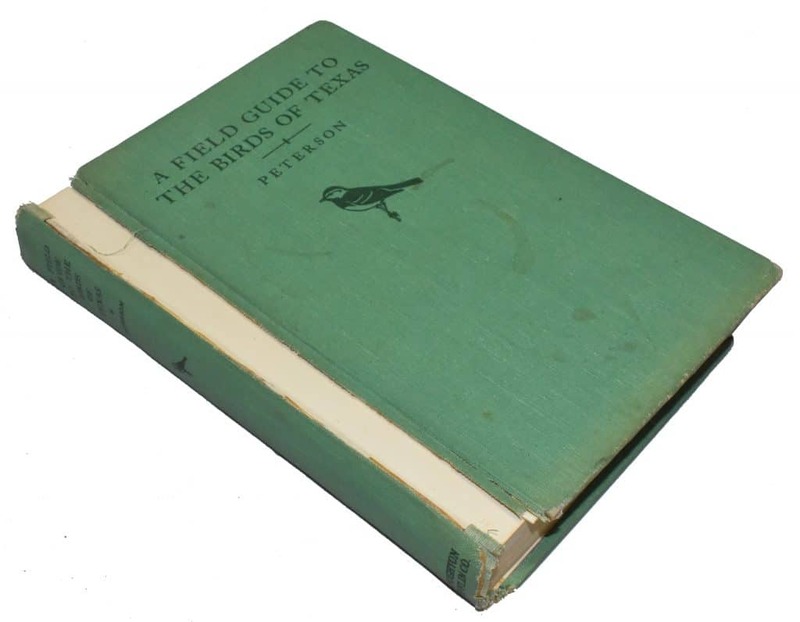 The book restoration technique used depends on the age of the book, the thickness of the original exterior front cover and its condition. 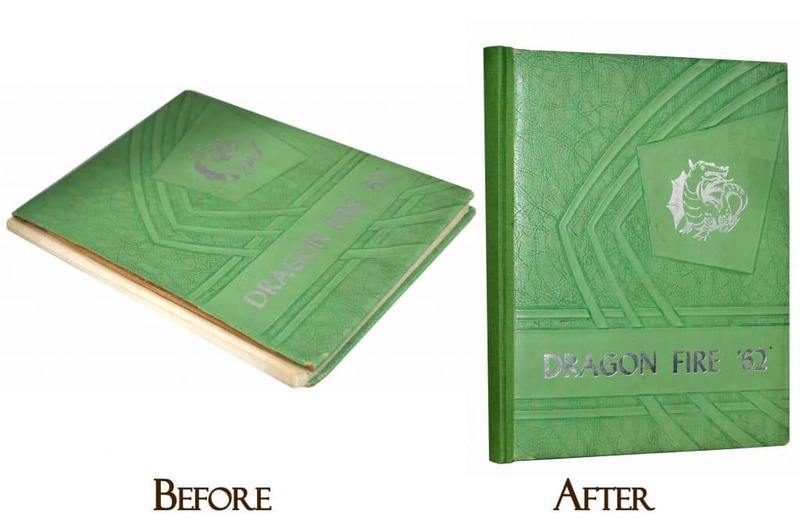 Here are some examples of different methods we use in book restoration. The "Before" photo shows a book with a completely missing spine. Our goal with this project is to save as much of the original beautiful front cover as possible. 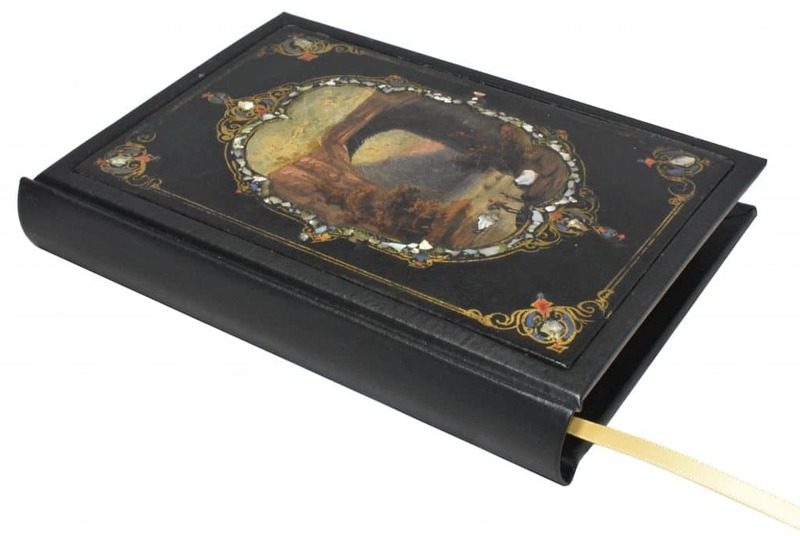 Our bookbinders determine that the best method for this project is to create a new spine and frame "well". We trim and attach the original exterior cover to the "well" that is part of the new frame. 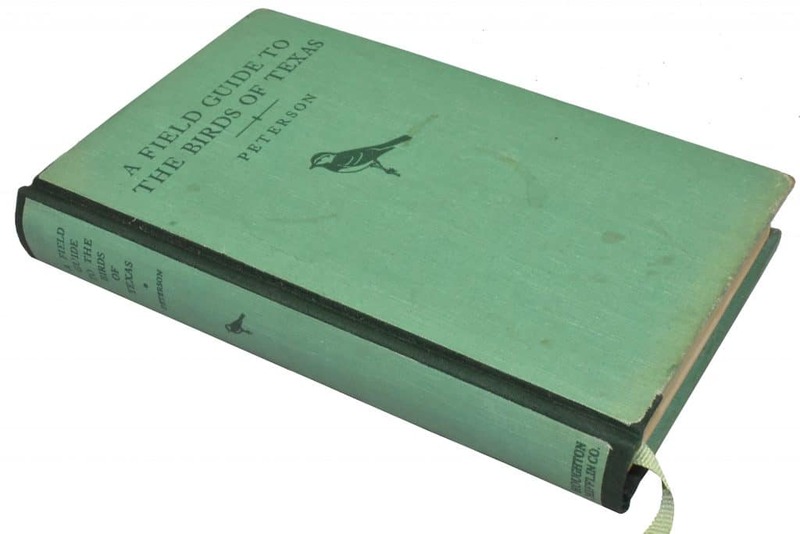 We add a satin ribbon to complete the book restoration. Sometimes, if a front cover's edge is too disintegrated or uneven, it could prevent the bookbinder from slicing into it and joining it with the spine. Also, sometimes, if the original exterior cover is too thick, placing it into a well is not practical. Our bookbinders may use a technique where they create a new thicker spine and integrate the cover into this new spine. 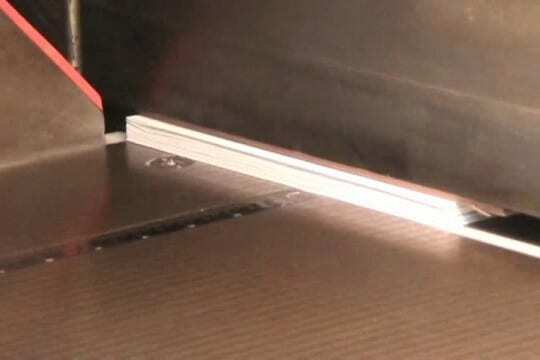 In this instance, the book restoration involves creating a new spine and corners. We foil stamped the title on the new spine. The "Before" photo shows a Book with a completely detached cover. Even with this type of damage, our bookbinders employ what we call a "Splice Method". Whatever is left of the original spine is carefully removed, trimmed and glued to a newly constructed spine. The bookbinders create a notched space in the original detached cover and the new spine is carefully spliced together. This is a popular technique. The new spine, together with the spliced cover give the book a renewed functionality. Meticulously cleans the binding edge of the block, removes the old glue and prepares the block for hand groove stitching. Builds a new spine and makes it ready to receive the original old book cover. 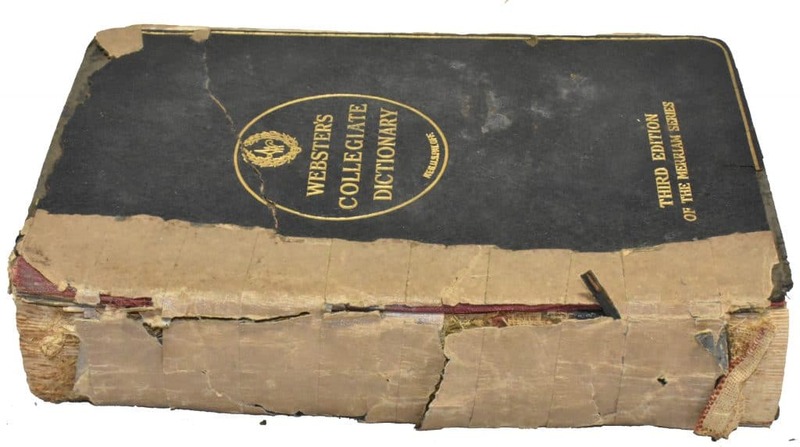 Many old books have pages that have worn or dirty edges. 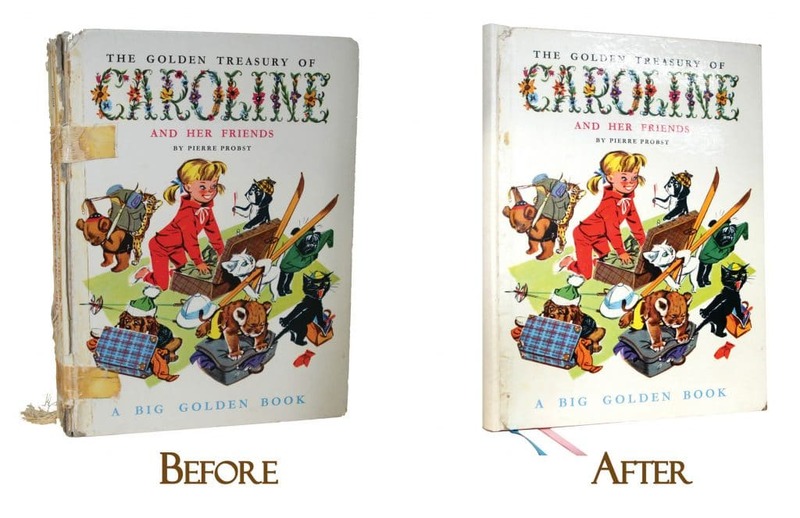 After any page replacement or repairs, some customers want their book restoration to include a clean look on the edge of the pages to match the new look on the exterior. 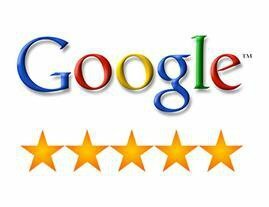 We use a professional hydraulic paper cutter that uses special shape blades and thousands of pounds of pressure to get a razor clean cut. We believe the book restoration process should include attention to these edges. Please know that if you have notes near any of the edges of the pages that the notes may be trimmed during the Face Trim process. Please let us know if you do not want the book restoration process to include a "Face Trim". 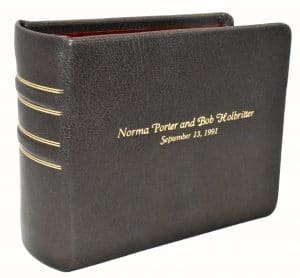 When we meet to discuss your book restoration project or after we inspect your book if you ship it to us, we want to talk about great "Options and Extras" that you may want as part of your book restoration. For more information about what is available, we encourage you to go to Options and Extras Page. Let us know if you are wanting to preserve the spine and/or the front exterior cover. We want to discuss the options. Do you want a "Well" method type of repair? 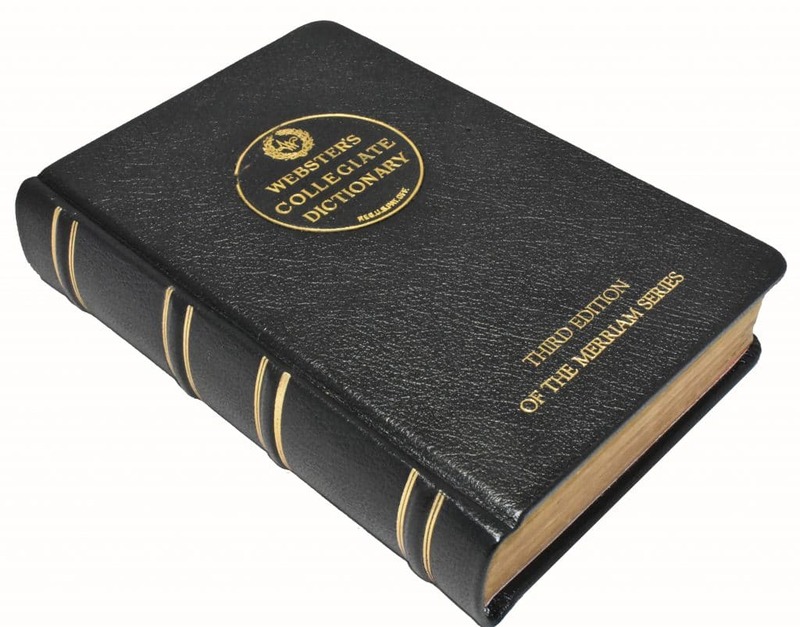 Material Upgrades: Our book restoration price includes a very high quality bonded leather. There is an option to upgrade to beautiful and durable goatskins and cow plonge leathers. Page Marker Ribbons: You can select color(s) and the up to three ribbons. Foil Stamping: When original spines need to be replaced, we can often replicate nearly identical foil stamping on the spine. Its your option so if you want to change the foiling to new and different text, names or images for your book restoration, please let us know. Click to learn more about hot foil stamping. Spine bands and Rule lines: While these are more often associated with our Bible Personalization service, if you want them, we can do it. A good example is the dictionary photo at the bottom of this page. Raised bands on a new spine add character and dimension while the rule lines can look great by themselves or used to make the spine bands stand out. 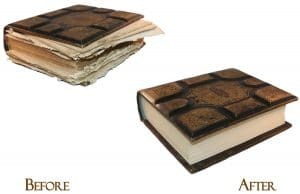 Upgrade End sheets: The book restoration price includes an end sheet choice of ivory, white or black stock paper, but we have beautiful and more durable upgrade options and can replicate existing end sheets using graphic design techniques. We can also "repair" damaged end sheets and reproduce them. 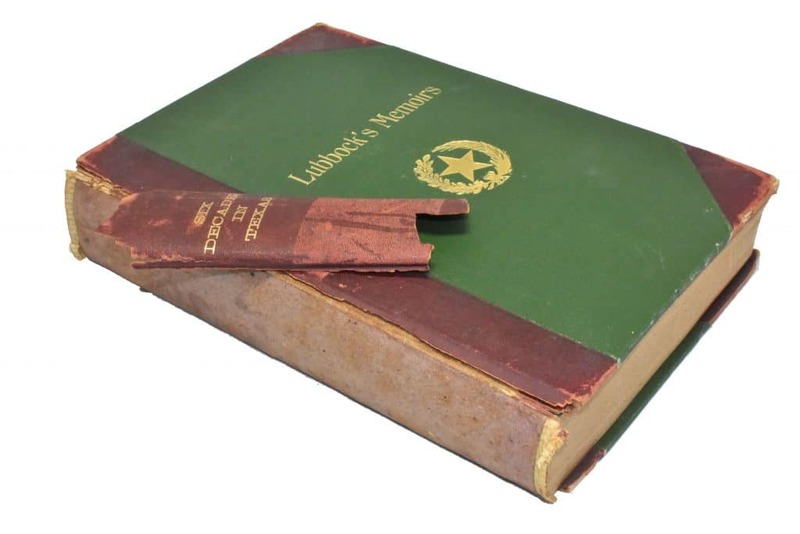 Repairing torn or damaged pages: Are there torn or damaged pages? Do the page edges have "dog ears"? For more information see our Page Repair page. Missing text or pages replaced: If missing a portion of the text, most often, we can recreate the missing text. Leather Cover Treatments: When saving an original exterior, it may need Conditioners, Sealants or a Red Rot Treatment.